This EXCLUSIVE "I'm Sorry" Poetry Gift is meant to help you express your sincere sorrow and also help you get back in your loved one's good graces. 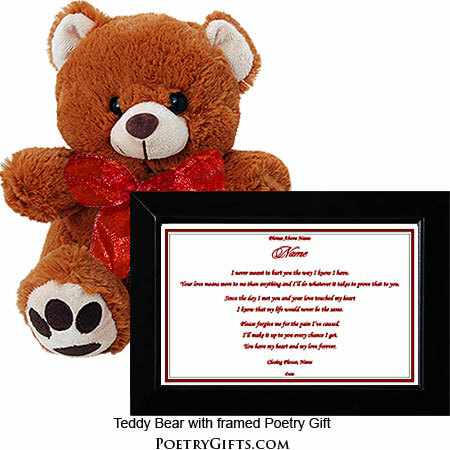 The cute 10" teddy bear and the heartfelt poem presented in a modern black frame (outer dimensions 5"x7") is a winning combination. The picture frame can be hung or because of its easel back, can be displayed on a table or desk and read over and over again. When you need a unique way to say "I'm Sorry" consider sending this Poetry Gift. 3. 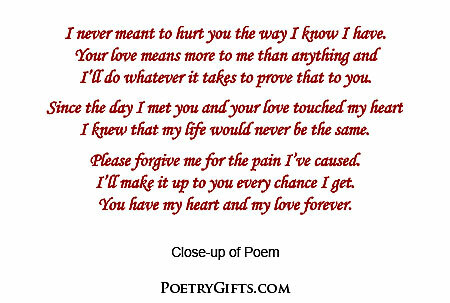 Closing Phrase and Your Name (as seen after poem) - Examples: Your Love Means Everything To Me, Sara; Please Give Me Another Chance, James; etc."